A diminutive Tuscan hilltop village in the heart of white truffle country, San Miniato is about halfway between Pisa and Florence and south of Lucca, making it an ideal day trip destination for serious gourmands. With its picturesque medieval center and enviable views of the lush Arno Valley below, San Miniato is a wonderful destination year-round. The most popular time of year to visit, however, is in November, when the annual truffle festival fills the ancient streets with parades, concerts, artisan vendors and, of course, the intoxicating aroma of the world’s most exclusive mushroom. San Miniato is also known for its outdoor theatre. Nighttime puppet shows, mime, religious theatre, and traditional plays are put on in the town’s squares during the summer months, adding a unique cultural element to this medieval village. The town’s privileged position overlooking the valley has made it a desirable location for millennia. People were living here as far back as the Paleolithic era, and Etruscan and Roman ruins are scattered nearby. During the middle ages, this was an important stop on the Via Francigena and other major trade routes, bringing a potpourri of cultural influences to the crossroads town. The historic nucleus of San Miniato is a series of steep and winding streets where you will find an eclectic collection of churches, plazas, palaces convents and defensive structures in a myriad of architectural styles. Combining a Romanesque base with Gothic and Renaissance flourishes is the Cathedral, with its famously ornate ceiling and adjacent defense tower. Nearby looms Frederic’s Tower, which was rebuilt in 1958 after the 13th-century original was destroyed during World War II. From the top, you can enjoy expansive views over the countryside and, if it’s a clear day, to the sea. Also seek out monasteries like San Domenico or San Francesco, or palaces like the 12th-century Palazzo dei Vicari or 14th-century Palazzo Comunale. The prized (and pricey) white truffle is San Miniato’s main claim to fame and is the star of a popular truffle festival, held each year in November. The town and surrounding countryside are the source of nearly a quarter of Italy’s white truffles and are considered the country’s best-hunting grounds for large, high-quality truffles. San Miniato can also boast the world’s biggest truffle (2.52 Kg), which was found here in 1954 and given to US president Harry Truman as a gift. Nearly all the truffles of the area are gathered by a group of families who call themselves the Tartufai Delle Colline Samminiatesi (“Truffle-gatherers of the San Miniato Hills”) and have passed down their secret methods for generations. Even if you’re not here in truffle season (October through December), there’s no escaping the town’s signature product. Truffle-flavored sausages, truffle oils, and truffles in a jar are just a few of the many truffle-tinged food products that fill stores and restaurant menus. Truffles may get all the attention, but they’re not the only things growing in the fertile countryside surrounding San Miniato. 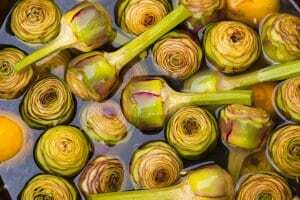 The San Miniato artichoke is considered one of the world’s tastiest artichoke varieties, and the olives grown nearby produce a pungent, flavorful oil. The area is also known for its excellent bread and pastries and for its many varieties of pork products. Tuscan wines of every description are available here, but especially popular is Vin Santo, a sweet wine made from overripe San Colombano grapes. San Miniato’s looming Duomo, or Cathedral, is a pleasing mix of Romanesque, Gothic and Renaissance styles. Its signature architectural element is the Matilde bell tower, the oldest part of the construction. Just beside the Duomo is an interesting sacred art museum featuring the works of important Italian artists like Fra Bartolomeo and Filippo Lippi. Special private truffle hunts are arranged by local tartufi companies, and you can sniff out your own truffles with the assistance of your hosts and the reliable truffle hounds. Contact us for information on arranging a gourmet truffle hunt. Today’s town hall, this pretty palace was built in the 14th century. Standing proud over the village and the entire valley, the 192-meter-tall tower was first erected in the 13th century, although what we see today is a reconstruction dating to 1958. This 12th-century palace-turned-hotel features beautiful frescoes inside and a picturesque tower. Lovely in its simplicity, the church of San Francesco is a cavernous space. The adjacent monastery hides a tranquil cloister and a terrace with wonderful views.